Kilbirnie Recreation Centre is located near Kilbirnie Pool and Kilbirnie Park. The centre has been upgraded in recent years with new, modern facilities for skateboards, bikes, scooters, roller skates and inline skates. No doubt you already know some of Wellington’s best attractions, but if you are staying locally in Kilbirnie be sure to check out the Kilbirnie Rec, it’s great family fun that’s a hit with the kids. 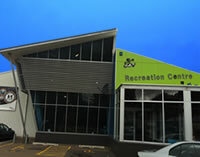 Kilbirnie Recreation Centre is located at 101 Kilbirnie Crescent.